I am so excited to share this exciting event with you for May. 30 Days to Easy Gluten-Free Living starts Monday May 2nd. Every day you will be treated to a wonderful tour around the blogersphere with different bloggers sharing tips and recipes on helping you live gluten free, the easy way. First a little story on how this came about. One day I was reading yet another story somewhere about how hard it is to live gluten free. It was expensive, you would have to eat food that didn’t taste good, no where to eat out, traveling was a nightmare and on and on. They made it sound like the most horrible thing that anyone would have to do and that you would have to sacrifice so many foods. It was like a life in prison. Well that was the last straw for me. I shot off an email to a group of gluten free blogger friends ranting and raving about how sick and tired I was of reading this and we should get together and show people that it’s not that at all. Now yes it can be a lot to take in the first moment you are told this, but so is will you marry me, you’re pregnant, you got the house, you got into your top pick school and other life changing statements. But you figured out how it all worked and so you can with living gluten free. We’re just going to give you a big cheat sheet. Well the bloggers were wonderful and were really happy that we were going to put out the real info on what it’s like to live gluten free. There will be recipes and tips and all sorts of fun things to learn and try. Some may be new but others may just be a little twist on what you’ve always done. Now here is the important thing I want you to know. Every day these blog posts will not be here on this blog like the event I did last year, 30 Days to a Food Revolution. They will be on that blogger’s blog. So you need to know a few things. 1. the home page with the entire schedule can be found by clicking HERE or looking at the very top green bar of this blog where it says 30 Days to Easy Gluten-Free Living. 2. check out the schedule and every day go to that blog to see what they have posted! 3. make it easy on yourself and follow the links now to those blogs and grab their feed or sign up to have their blog posts delivered to your email in box. 4. If you are on Twitter you’ll be looking for #easygfliving to keep track. You can also jump to either of my Diane Eblin or The WHOLE Gang Facebook pages and the bloggers participating Facebook page too. Remember you can get the updated links to the actual blog posts on my 30 Days to Easy Gluten-Free Living Page. Check there every day. Here’s the schedule to get you started. 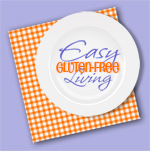 The topics are still rolling in so for the most up to date info go to the 30 Days to Easy Gluten-Free Living page. Thursday May 19th Heidi from Adventures of a Gluten-Free Mom sharing tips for getting kids to eat healthy, real-food snacks! I get as upset as you do, Diane, when I hear those negative statements. Your analogies on all the other big things in our lives that seem overwhelming at first is a great one. With those, we do move on and pretty soon, those changes seem perfectly normal. The same IS true for living gluten free! But we have to embrace it, not fight it. Can't wait to see all the posts and so honored to be a part of this event. Thank you so much for initiating and hosting, Diane! Shirley I think we all fight so many things especially when they go in a direction we had not expected or thought about. I do it all the time and you think by now I'd get it that I just need to go with the flow and that is when the learning happens and the joy of whatever it is that we're doing. Living gluten free is just like that too. You know I get all hot and bothered easily. I can't wait to see what everyone shares. I'm thinking we'll have a great book at the end of this! If you need any last minute postings, I would love to join this awesome list of gluten-free bloggers. I have been gluten-free for over 30 years and I don't like having Celiac Disease ever stop me! Thank you Erin. I'm thinking this is so fun we might have to keep it going. I know we can come up with more than 30 tips. I'll let you know if we do that. Thank you for volunteering. I will definitely be following all of you and ready to learn the entire month of May. I am one of the ones who frustrate you, but I think Shirley has it right….it may be easier than I think, but I guess I fight it. I have a lot of allergies to go along with it, so the recipes I find are not always for me with my other allergies. But I am giving May as my month to learn from all of you. Ashley we all fight things way too much, me included. I think when we kind of give in or accept things are different, then we can start to fulling live and enjoy it. There are tons of substitues for just about anything and the cleaner you eat the easier it will be. If you have an iphone or ipad check out Cook it Allergy Free. Great app where you can sub out ingredients and it saves the recipes and gives you a shopping list. Diane, I just came upon your website through Elana's Pantry (and loving it!). I was intrigued to see Nina M's advert on your page. I am currently enrolled at IIN and Nina is my Coach. I also blog gluten free and was wondering how to get more involved in your gluten free month extravaganza. This is very enthusiastic to join with many gluten free bloggers will be discussing and sharing their best ideas and information to help out many people suffering celiac disease and gluten intolerance.